Remember Snack Pack pudding? I guess that question isn’t a huge stretch because it is still around. The packaging looks nothing like it did when it sat in my Donny and Marie lunchbox, just waiting to be eaten with a plastic spoon. I thought that pudding, chocolate flavor only please, was the best thing about bringing lunch to school. I didn’t get it every day but it was a happy day when I did. Graham, my kindergartner, has never heard of Snack Pack pudding and I’m pretty sure, up until recently, he had never had pudding at all. In case you think that is because I don’t give him sweets, or I only give him whole grain treats or even just homemade treats, you would be mistaken. I am liberal with my sweet giving. This is another post for another time, but suffice it to say that while I prefer him to eat things that I have made, the lure of Halloween/Valentine’s Day/Easter candy can be great. I do try to draw the line at certain things (which would probably seem arbitrary to a more strict mother), and pudding that does not have to be refrigerated and is full of things I can’t pronounce is one of those lines. While pudding is not a dessert that pops into my mind with any regularity, it certainly has its place. Comfort food at its most comfortable. And how about if the pudding is butterscotch and sitting inside a tart shell? 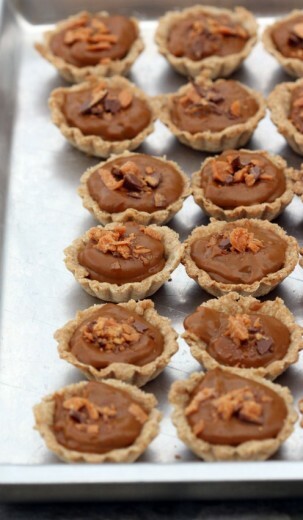 Mini tart shells? Not long ago, I purchased 24 mini tart pans. At 79 cents a pop this was not a huge investment. And they have allowed me to make super cute appetizers and desserts. I had no problem getting 24 rounds of dough out of the recipe and I actually had some pudding left over once they were all filled. I filled two small bowls with the butterscotch pudding and gave it to my boys. Neither of them liked it. By the way, who was on your favorite lunchbox? Below is the recipe as written for the larger tarts. Add the butter and pulse until the butter pieces are small and the dough looks crumbly, like coarse sand. Add the milk and pulse for a few seconds.. Using a rolling pin, roll each dough ball into a 6-inch round just over 1/8-inch thick. Place a round over a 4-inch tart pan and very gently press the dough into the pan. Roll the rolling pin over the pan to trim off excess. Repeat with the remaining dough rounds. Preheat the oven to 325ºF. Put the tarts pans in the freezer for 30 minutes. Remove the tarts pans from the freezer and arrange on a baking sheet and gently prick the dough with a fork. Bake on the baking sheet until golden brown, 12 to 15 minutes, rotating the baking sheet halfway through the baking time. Transfer the tart pans to wire racks and let cool completely. Remove from the heat and add the butter and whiskey. Keep whisking vigorously for about 1 minute to cool the pudding slightly. Let the pudding sit for about 15 minutes, then remove the vanilla bean. Whisk the pudding one more time until smooth. 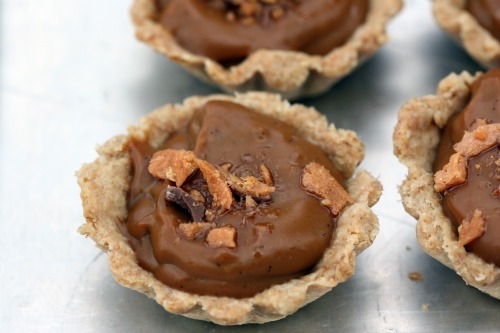 Divide the pudding equally among the tart shells and sprinkle the crumbled candy bar over the pudding. Cover the tarts with plastic wrap and put the in the refrigerator for about 2 hours before serving. The tarts can be stored, tightly covered, in the refrigerator for up to 2 days. I’ve made these before, they are really yummy! Butterscotch is one of my favorite all-time flavors and you had me the second I realized that is crushed up Butterfinger on top. Have to try this one. Oh those snack packs. We had the jello ones. Sometimes. If we were lucky. I’m pretty sure that I had a beauty and the beast lunchbox. It was very pink and I loved it very much. I love pudding but these days, homemade is most certainly the way to go. I’ve begun to realize that I can taste aspartame from a mile away and those snack packs contain a TON of it! I’m much rather have the infinitely more real tasting homemade version. And butterscotch could never fail to please! Love these! Once again, I will be making your recipe for an upcoming party. Years ago, I attempted to make a butterscotch pie, and it didn’t turn out well. I complained about it to my mom who then told me my grandmother’s favorite thing was butterscotch pie and she liked it topped with meringue. I’ve had that in the back of my mind since then, and I’ve been trying to find a really good butterscotch pudding recipe to use for the pie. Two I’ve tried were just so-so. Then, I forgot about it for a while. Thanks for the reminder about butterscotch pudding, and now I have to grab that book try this one! I hear you about drawing a line – even though it may seem completely arbitrary to an outsider. My boy is not a fan of butterscotch either. His fav is chocolate too. 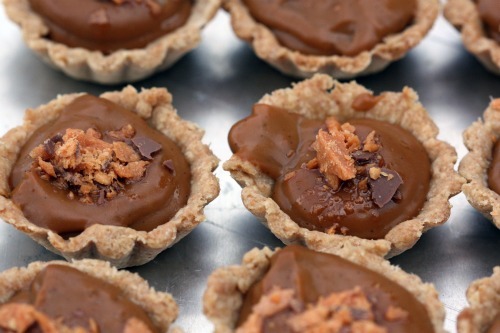 These tarts look yummy. I’m not a huge pudding fan though I like it in small doses like these. In an attempt to get more milk/calcium into my girls, I tried making the Shirriff cooked chocolate pudding and ended up eating most of it myself – guess the girls aren’t big fans either. I really liked my brother’s Snoopy lunchbox. totally a good investment. I love mini things. These are so cute and a great place for pudding. I’ve always thought it needed a little crunch contrast, so this looks perfect. I loved fruit snacks – things like fruit by the foot, fruit roll ups…we didn’t get them often, but when we did, I coveted those little snacks! OMG..you had a Donny and Marie lunchbox??? I almost piddles in my pants. I was not that adventurous, I had care bares and strawberry shortcakeThat is some funny stuff! These look delish. I had a purple Donny and Marie lunch box. I was very sad that I wasn’t able to get the Partridge Family. Pudding is one of my favorite deserts, though I don’t think about making it often. HOLY MOLY the title of this post just made my heart skip a beat! Looks amazing.